Pavilion – Restaurant & Cafe Muse Template Created by Nublis. This templates have specific characteristics, namely: Pavilion has features such as Resolution: Desktop, Tablet, Mobile, Software Version: Muse CC 2015.2.x . 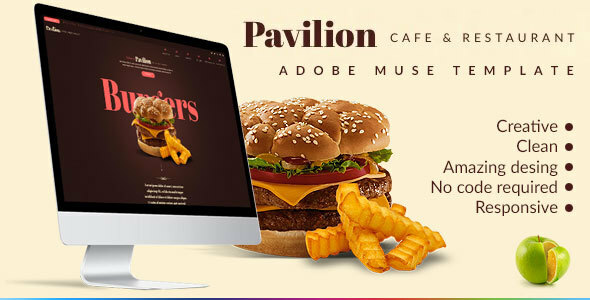 You can use this Pavilion – Restaurant & Cafe Muse Template on Muse templates category for adobemuse, burger, cafe, chef, coffee, creative, food, menu, muse, restaurant and another uses. Pavilion – is a modern and clean Adobe Muse template designed for Cafe – Restaurants. To edit this template with Adobe Muse is very easy! You can change colors, texts or replace the images in a few minutes.